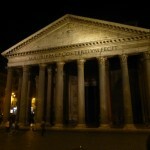 Over the last few days of my program, I began to feel the approach of winter arriving in Rome. The wind chilled my face as I crossed the Tiber River and the lush vegetables of the autumn harvest began to gradually lose their brilliance as a shift in the seasons began. With the program coming to an end, I began to reflect on my time in Italy that has led to such a culturally enriching experience. As I have spent the past two months traveling across Italy, my time abroad has culminated into an understanding that has not only changed my perspective on food, but my life forever. While our topic of study had ranged from the political, socioeconomic, and cultural factors of Italy’s food and global food policy as a whole, I was able to pull much more out of the program than solely what was taught in the curriculum. By spending time in the northern, central, and southern regions of Italy, working on farms, visiting international food conferences, and indulging in some of the best foods Rome has to offer, I have learned a new way of living and learning. Each of these experiences and the many more that I partook in around Italy has given me a rich rebirth in my passion for food. 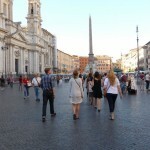 As I resided in Rome, I was fully immersed in nearly all aspects of Italian culture. In the mornings, I visited my favorite coffee bar for a Cappuccino and Cornetto (Italian style croissant), I took long lunch hours to sit and eat with friends, and most importantly I respected the sense of community that the Italians value through food. The Italians have such a sensible approach to living in my opinion as they value not only the quality of the food they eat, where it comes from, but also the people with who they share it with. By witnessing their “culture of the table” and living in their life style I am eager to share my experiences from Italy with my friends back home. As the program is ending, both my professor and peers are already planning on how we are going to take our experiences in Italy and apply them to our lives back home. One example of our plan of action will be our efforts to help with the growth of student run gardens on the Seattle Campus that will provide organic whole foods to UW students. Now, as being a student at the Bothell Campus, I am also advocating for a student run initiative to plant community gardens on the Bothell Campus that will be used to feed the students in on-campus housing. 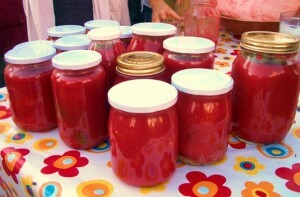 Along with helping to promote the growth of community based gardens in the UW community, my peers are also working as a whole to promote connections between the University of Washington and the American Academy in Rome, whose model of sustainable urban agriculture provides some of the best produce grown in Rome. By promoting these international connections between our university and other organizations across the globe, we are helping to raise awareness to the benefits of alternative food systems. Ones that can feed the world through much healthier and more satisfying means than what our current globalized food economy offers. While there are an abundant amount of opportunities in which I could apply my experiences abroad to the remainder of my academic career, the memories that I gained from my time in Italy are ones that will last a life time. I could not have asked for a more enriching experience than what was offered through the University of Washington. As an individual who is deeply passionate about food, this program opened up an enormous amount of opportunity for my future culinary endeavors. While my time in was Italy closely correlated with my passion, solely being abroad provided such wonderful opportunities for me, that I can whole heartedly recommend for any student, from any academic discipline to pursue studying abroad. It will be, as I can speak from experience, one of the most enriching experiences of your life! Just go out and follow your dreams! As the past few weeks have gone by and I begin to reflect on the experiences from my time in Italy so far, my passion for artisanal Italian food has skyrocketed. I have spent much time wandering the streets of Rome looking for traditional Trattoria’s (small bistros), artisan bakeries, and producer vendors, yet my wandering has made me curious about the source of all this amazing food. A major part of our program has been on the focus of our foods origins, and the idea how of we as consumers, should have the right, and responsibility, to know where our food comes from. The beauty of Italian cuisine is easily seen as the linkage between farm and table, and here, this connection is much stronger than in most other countries around the world. Over the past week I had a wonderful opportunity to learn, firsthand, how these products reach us by working at the source in a small picturesque farm in the hills of the Umbrian countryside. For the past week I worked at the Semi Bradi Farm, a small seven hector piece of land, which lies in the hills above the town of Gubbio, Italy. This small Tuscan farm is one of complete self-sufficiency where a group of ten young people work to provide food for sale, but more importantly, for themselves. As Fabio Santori, a young steward to the surrounding land in which he calls home, states that “while I may not be rich in money, I am rich in food” (Fabio, 2012). This is the philosophy that he works by to provide food for his young son, Pedro, and the others members of Semi Bradi. While Fabio is not the only full time farmer working as a part of the Semi Bradi team, his efforts encompass a passion for the land that is shared by each member. 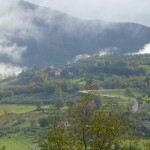 Another affiliate of Semi Bradi, Alessandro Paolini, was my interpreter for my time on the farm and believed very strongly in forming a solid relationship with the land, as it bears the foods that he identifies with as a Tuscan farmer. I had arrived at Semi Bradi during the third week of November which is a time where the harvest was busy at the farm. As the foods of autumn were in full bloom, I was kept busy in the farm harvesting, herding, and fixing whatever needed to be done. 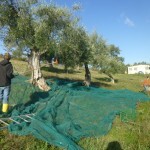 As the beginning of November is the time in which olives are harvested for the year, I spent a large part of my days helping comb the branches of Semi Bradi’s countless amounts of olive trees. As I looked over the trees, and out into the valleys surrounding the farm, I felt an urge of passion and satisfaction race through my veins. I was being a part the very beginning process of making olive oil, which in Italy is the lifeblood of not only their food, but their culture. There was something about getting cuts from the surrounding blackberry vines, and being covered in dirt that surrounded the tree that made this process of harvesting the olives so much more meaningful. As an aspiring chef, and a conscious consumer of food, I was feeling the toil of the labor that goes into an artisan product. I had a new respect for a product that honestly, I had taken for granted before. By seeing how many olives it takes to make just one liter of olive oil, I vowed to never waste another drop out of respect for the people who labor over these fruits. 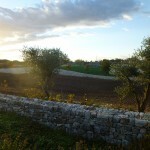 As the olives I picked were to be used for cooking on the Semi Bradi Farm and sold in the market, I could really see the satisfaction that Fabio, Alessandro, and all of the other members of the farm got from providing for themselves from the land. By seeing the real source of such an important product of Italian culture I felt as if my time wandering the streets of Rome was not lost. I was on a mission to find the find and appreciate the sources of the foods that make this culture so great. With much gratitude, after spending time on the Semi Bradi farm in Umbria, I am now even more intrigued with enjoying the foods that define Italian Culture and the places that they come from. As we are flying down the railways at over 300 Km/h back to Rome, the memory of Turin and the Terra Madre food conference are ones that will last a lifetime. 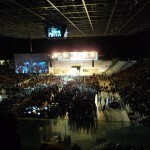 This year, Terra Madre was held within the retired Fiat Factory just off of the Via Nizza in the outskirts of Turin. This massive venue held thousands of small scale organic farmers, butchers, cheese makers, and artisans from every corner of the globe who all congregated together to share a passion for their food and culture. 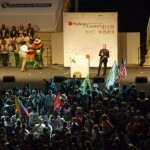 The Slow Food Movement, founded by Carlo Petrini in 1987 is the backbone of this event as they use Terra Madre to express their ideas of opposing globalization and advocating for the resurrection of traditional cuisine and culture not only within Italy, but all over the world. During the latter half of the 20th century, Carlo Petrini observed the degradation of Italian Cuisine through the commodification of traditional foods that were available to Italians, and in 1987, when McDonald’s opened up a restaurant adjacent to the Spanish Steps in Rome, the odor of french fries finally tipped Petrini to begin the Slow Food Movement. As a network that supports farmers, Terra Madre gives opportunities for the voices of small scale producers to be heard. Slow Food is also a basis for food scholars, advocates, and “gourmets” to come together and share alternative ideas of global food policy. 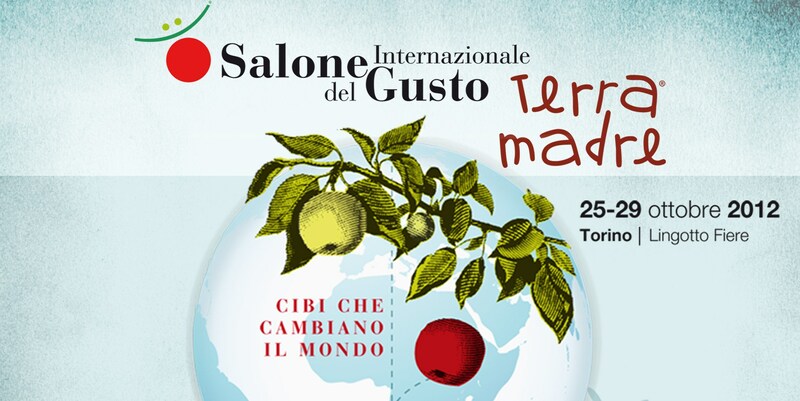 During Terra Madre, dozens of conferences are held daily that allow these professionals and advocates to hold forums that explore alternative means to food policy. Throughout my time at Terra Madre, I visited forums that catered to everything from sharing ideas for reforming the global coffee trading system to learning about integrating agricultural themes into the everyday curriculum of classrooms across Europe. Each of these forums hosted scholars that are known internationally for spearheading the movement of alternative economy around the world, and these forums were a melting pot of ideas that were exclusively formulated at Terra Madre. While hearing about the potential in alleviating global hunger through the efforts of supporting small scale agriculture, Terra Madre hosts an incredible platform for ideas, but for many, the real appeal is in the sheer amount of farmers, small producers, and artists that attend this event. As mentioned before, thousands of people from all over the world come to represent their county by bringing cultural artifacts, whether it may be food or crafts, to help share their passion for their own culture. Within the massive rooms that used to hold the old Fiat Factory, Italy is meticulously organized via its regions to house vendors who bring their products for sale and to sample. Imagine walking through a Costco Warehouse of only samples, and multiply that by x 100, and then maybe, just maybe, you can grasp the scale of Terra Madre. 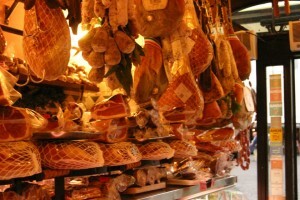 The products available in Terra Madre are not ones that you would find on the shelves of grocery stores, but only through the hands of passionate artisans that provide a sort of an intangible quality that is noticeable through the imperfections of their cured Salumes, cannoli’s, and cheeses that line the tables of Terra Madre. After 5 days of sampling some of the best foods that Italy has to offer and listening to some of the worlds most acclaimed food scholars, Terra Madre has left me with a new perspective of food. One that is eager to explore the alternatives of food policy, production, and consumption. In the words of Carlo Petrini, “be a co-producer, not a consumer.” This philosophy is an idea that may help define the future of the way we eat. 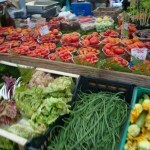 While having an abundance of good food at my fingertips available from the stalls of the Campo de Fiori market and its surrounding specialty shops, eating well is not hard to do. One of my greatest pleasures is cooking with foods that are straight from the farmer. By bringing food straight from the market stalls to my home, I feel as a consumer that I am helping to shorten the links from which food reaches the table. The feeling that I am helping sustain a farmer’s lifestyle by purchasing my foods from their fields is one that ensures I am fulfilling a responsibility as a conscious and ethical consumer. The assurance that I have from this practice warrants that not only farmers are taken care of, but I also have the privilege of enjoying fresh produce, cheeses, and meats that are cared for with passion. The passion that these farmers put into their products is shown through their quality, their uniqueness, and their flavor. These are not “cookie cutter” products that reflect modern day, genetically modified foods that have no flavor, but products that share a story about the farmers themselves. The terroir, or unique flavor, of each product of a farmer is recognizable as the land itself is reflected in the foods that it yields. The story of each of these foods is what I enjoy bringing to the table as an aspiring chef. My job is to allow the flavor of the food to shine by not adulterating it and by having such wonderful produce available in autumn, this is not hard to do! By having such an abundance of foods available from chanterelle mushrooms, winter greens, pumpkins, and a plethora of fall herbs, I am in heaven with the amount of endless opportunities to cook from. During the past few weeks of our program, we have been hosting a series of pot lucks and cooking lessons within the university. They have been a great medium of congregation as the promise of quality food brings everyone together. All of the students are extremely talented cook as well and when we all come together during one of our pot lucks there is no shortage of delicious food to be enjoyed. The market as well has provided such a focal point for conversation, company, and good cheer as we all enjoy the fruits of its bounty. The joys of purchasing produce just a stone’s throw away and enjoying it with friends has really been a very festive part of the trip. 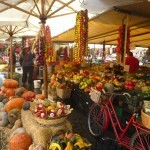 By connecting with friends through food and supporting the farmers who uphold the pillars of traditional Italian cuisine and food culture, buying food from the Campo de Fiori Market and coming together to celebrate its quality is just one of the simple joys here in Rome. As we are reaching our half way point through the quarter, which flew by in the blink of an eye, we are now on our way to the Terra Madre, an international food conference. 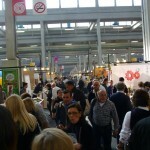 Terra Madre is an annual conference held in Turin, Italy, that offers a platform for farmers, gourmets, and artisanal producers from all over the world to come together and share ideas about food conservation, innovation, and what the world may hold for in terms of future food policy. My next entry will be reflective of my experiences at Terra Madre as we will understand the perspectives of some of the world’s most acclaimed food scholars and activists. 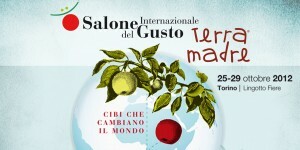 Below is a link to check out the Terra Madre and the Slow Food Movement! As the last few weeks of my time here in Rome have flown by in the blink of an eye, I feel as if I am really starting to sink into the flow of Italian life. 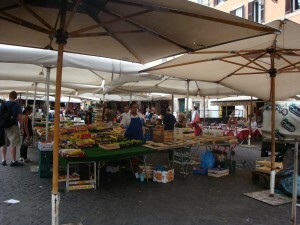 The days have leisurely been spent enjoying all of which the Campo de Fiori and the surrounding area has to offer. The heart of my studies here rests in the studies of the culture and politics food. As part of our curriculum we are analyzing the anthropological characteristics of Italian cuisine. 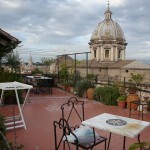 What is known to the Italians as the “culture of the table” is one of the ideas we are studying. 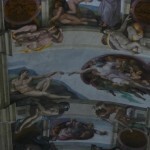 The notion of how food is used as a medium for congregation is notably a unique part of Italian culture. The real beauty of this in my opinion lies in the simplicity and the quality of their food. 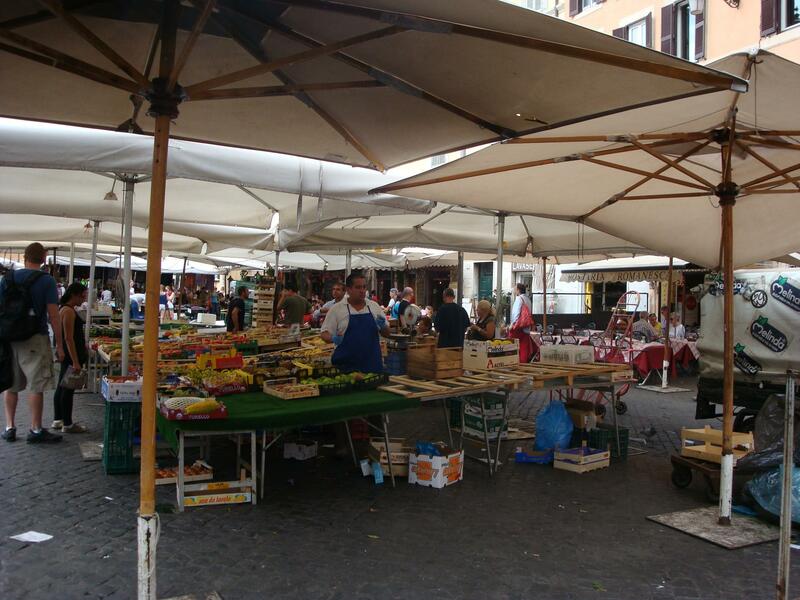 The Campo de Fiori market, which rests within the shadow of the University of Washington Rome Center is one of the many epicenters of good food in Rome. The market outside the UWRC runs every day as vendors come from afar come to sell their produce to the crowds of both tourists and locals. Lined around the plethora of fruit, vegetable, and pasta vendors are artisanal shops, some of which have been around for over a century. Together, each of the shops, cafés, and markets stalls all create a buzzing atmosphere that helps confirm the fact that you are in one of Rome’s most well-known gastronomic capitals. Each day is amazing as I am able to find a new treasure in the market. Whether it is enjoying a pizza Bianca (pizza seasoned with very good olive oil and sea salt) from the famous Forno Bakery, or a piece of creamy gorgonzola from the local Latteria (cheese shop), the Campo de Fiori consistently surprises me with its passion for good food. 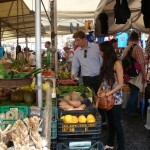 Purchasing daily from the fresh selection of foods in the market is a change I could get used to while living in Rome. While there are many grocery stores that occupy the winding streets of Rome, there is an intangible satisfaction I get from buying my foods straight from the farmer. Something about the simplicity and the quality of what you are about to eat, just makes it so much more enjoyable. Who knew living so simply could be so good? Ciao friends! 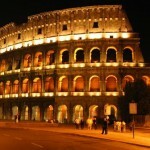 It has been about a week since I have landed in the beautiful city of Roma. After a series of long flights, a lot of airline food, and many, many long lines I have finally settled into my new apartment! Rome is a dream come true, and just as picturesque as one would see on postcards sold in the local tabaccheria’s (tobacco stores). 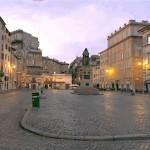 I have the pleasure of residing in the heart of Rome on the Piazza del Biscione overlooking the bustling Campo de Fiori Square. 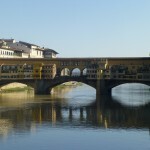 As the Campo holds a daily market of fresh produce, cheeses, pastas, salumes, and every other essential of Italian gastronomy, it is a popular area with the city’s epicurean types. There is a sense of passion for food here that is incredible. Some of Rome’s oldest bakeries, delicatessen’s, and produce venders all have established themselves in this part of the city as they provide the foods that make this city so well known. As my own, 1 bedroom studio apartment is just a stone’s throw away from the Campo, I’ll be spending much of my time enjoying the gourmet delights that are offered throughout the market. As the rhythm of the program is slowing setting its pace and the days are becoming busier, we are lucky enough to have free time to explore the twisting side streets of Rome. Fiats, Vespa’s, and pedestrians fill these narrow alleys, the fragrance of artisanal bakeries warm the air. The commotions of the locals on their way around force vigilance as I try not to steer clear of their predetermined paths. The atmosphere here is like nothing I have ever experienced before. It’s still hard swallowing the fact that this metropolis of food, wine, and ancient culture will be my home for the next few months. 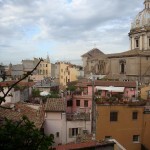 The Italians seem to have a knack for living. Congregating at the coffee bars in the morning for a cappuccino, enjoying a siesta every afternoon, and taking late night gelato strolls are just a few of the things that make life here so grand. With only a matter of weeks left until I board my flight and begin on the trip of a lifetime, the thoughts that this trip is finally becoming a reality is really starting to hit me. While there was no turning back now, the feelings of embarking are cascading down on me like a dream slowly unfolding. By being able to go to Italy to learn about the very essence of Italian Cuisine and culture, I am fulfilling a personal vision of mine to learn more about the connection between people and food. But by doing so in a way where I am earning college credit, UW Bothell makes this vision much more of a tangible reality. I feel so fortunate in the sense that I am able to quench two thirsts with this trip. One is being able to stick to my academic career through my pursuit of a degree in business, and the second by being able to satisfy my passion for travel and experiencing different cultures through food. By adding an international experience of this magnitude to my educational repertoire, I am able to not only help feed my passion for cooking, but also share the experiences I will gain from Italy with my peers to help UW Bothell grow as a more culturally appreciative campus. The benefits of having this opportunity to travel during my college experience are one that will add an intangible depth of experience to my life. While having the privilege to study in the heart of Rome, I feel privileged to be able to add such an experience to my educational repertoire. By having the opportunity to see how the Italians study, eat, and live their lives, I am sure the experiences I will have will greatly enhance my perspective of European culture and the greater world. With this enhanced perspective of the world beyond UW Bothell, I feel that I will be able to take what I learn in Italy and bring it back to help better the remainder of my academic career. By having an outlook about the world that not every student has the opportunity to obtain, I am sure that my experiences in Italy will do nothing but help scaffold a tier for success in both my academic and culinary aspirations. Beyond my academic goals, my time Italy will surely add an invaluable touch to my culinary ambitions as well. While Italy has one of the most beloved cuisines in the world, eating in the heart of Rome will surely be one of the highlights of my trip! Having an espresso by morning, a pizza al taglio by lunch, and one of hundreds delectable pasta dishes by dinner, I will certainly leave Rome will a full stomach and a nourished palate. But beyond eating, just being in Rome will be a satisfying experience as I will be able to watch the chefs work, and hopefully create connections with a few to use in the likely event that I will one day return to Rome hungry for more. With only a few weeks left before I board the plane, my bags are beginning to be dusted off as I start packing for one of the most influential experiences of my life. As for now, I am sure that my hopes and expectations of Rome will be greatly surpassed upon touching down at the Leonardo da Vinci Airport in the town of Fiumicino. As summer is slowly passing by us, and the days are getting shorter, my departure date for Rome is energetically nearing. I’d say that even though summer is ending, I’ve never been so excited for the quarter to start! I can now see all of my preparation coming together as my flight is now booked, my weekend excursions are planned, and my textbooks are being ordered! While there was an abundant amount of preparation that went into making this dream a reality, much of it was made possible by looking to the students, staff, and faculty at the University of Washington for assistance. By hearing my peers stories of their time abroad and the amazing memories they will forever hold, their experiences helped to conjure up my imagination and my motivation to seek out this opportunity for myself. While knowing that the course I would be taking would be at the 490 level, being a sophomore, I nearly shuttered at the fear of doing such a thing. But after careful thought, I concluded that a chance to spend a few months in Rome, studying the very culture that my passion originates from is a precious opportunity. While the academics will surely be daunting, the experience is one that will forever change my perspective on life and my passion towards food. This is not something to pass up due to fear of success academically. Now, paying for such an odyssey, that’s another obstacle. While I had made up my mind early on about dedicating both my time and money to studying abroad, I had to come up with my budget myself. By being a nearly financially independent student, this meant working to pay for the trip, and lots of it. While I could bust my rear end working overtime every week to satisfy my budget, I chose to use my brain rather than my back. From seeing the dozens of emails that go out daily from the University of Washington, I remember noticing the multitude of scholarship opportunities that were sent out to students interested in pursuing study abroad. Initially, to be honest, I didn’t think much of them, but when the time came for me to satisfy a budget, these opportunities were the light at the end of the tunnel! 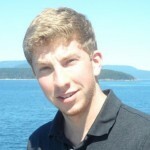 By using my sought out professional relationships with the faculty and staff at UW, I was able to use the connections I had made over the previous academic year to assist me in my search and process of finding and filling out scholarship applications. These connections were intangible because they lead me to the peace of mind knowing that I had the opportunity to earn the funding necessary for this trip through my academic and personal merits. After receiving two scholarships to help fund my trip, I breathed a sigh of relief as I was slowly making the allocations necessary to fulfill my budget. (But seriously, apply for scholarships, they are worth every penny!) By talking to my academic advisers and all of the wonderful ladies in the study abroad offices in both UW Bothell and UW Seattle, I was really able to solidify my hopes and preparations to go to Italy! As the ball is continuing to roll and my trip is coming up in the near future, another thought came to mind. Who would be going on this trip with me? Would there be people with similar passions that I have? Well, as I soon found out, out of the 16 students accepted to the program, I was the one and only guy. What are the chances of that?! After learning that I was the only guy, I was curious to why no other men were accepted for this trip? Was the course really that targeted towards a lady audience, or did I just have dumb luck and had the opportunity to travel half way around the world with 15 young ladies? Only time will tell! While this odd ratio of male to female students will certainly add to the character of the trip, studying abroad with others who have similar interests is a great way to connect with people. By having such an influential experience together, I am sure the connections made during this trip will last a lifetime. While my commitment to pursue study abroad didn’t happen overnight, my passion for cooking has always been a large part of my life. For years I have spent a tremendous amount of time working to further my knowledge of food. Whether it may have been apprenticing in restaurants at a young age, spending countless hours reading cookbooks, or religiously watching the Food Network, the time I spent pursuing my passion has always been beneficial in pushing me closer to my goals. But while doing these things, I knew I still lacked a truly global perspective of food and culture that is a part of becoming a chef. While knowing the preparation of a certain cultures food is essential, understanding the culture behind the people themselves is a necessary addendum as well. By understanding the intangible satisfaction one can get from eating a meal that makes them reminisce their childhood, or of an exotic place that they once travelled, is the type of understanding that I am looking for as I travel to Italy to understand their culture. This understanding is like a troubled love affair that I have with food, as I try to see how the Italians can use it to represent their own culture and ultimately bring people from different cultures together because of it. By knowing that this is achievable all over Italy, whether it may be in the heart of the Campo di Fiori in Rome, or scattered amongst the Tuscan hillsides, I am motivated to seek it out. 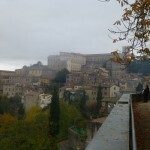 As my study abroad trip in the fall approaches, I am becoming more and more jubilant with the thought that my dream of traveling to Italy to find this connection is unfolding right in front of me. While going with a determined goal in mind, I was admittedly nervous in the beginning of whether or not I would be able attend the trip. I mean, while I have my passion for food to feed, I know that as a student I have responsibilities to uphold, deadlines to meet, and papers to write. I was afraid that by taking the time to travel half way around the globe would deter my chances of achieving my academic goals. Luckily, with a lot of help from my colleagues I learned that this was not the case. While being an aspiring Business Major, I couldn’t see the real connection of where an anthropology based curriculum would satisfy any of my program requirements. It didn’t seem rational either to invest time, money, and preparation into a program that didn’t benefit my long term academic goals. But, as this program is a picture perfect representation of my passion, being a class on the culture and politics behind food, I knew there must be a pliable connection I could make to pursue this amazing opportunity. And fortunately, after doing further research into the kinds of prerequisites required for a degree in business I found that this course could actually satisfy my necessary higher level elective requirements! After having the conversation with my academic adviser, my dream of traveling to Italy was finally coming true! After confirming my commitment to pursue the program I was so happy to see that it was possible to connect my passion for food to my academic career. The thought of applying for the program became even more feasible after this realization! By having a solid connection of how my long term life goals applied to the topic of this course, I had no problem answering the extended essay questions of the application, requesting letters of recommendations, or explaining to my Boss, Chef Lynn Tran why I needed to take two months off of work! Luckily, each of my advisers, whether it was academic or professional, was more than helpful in facilitating the process of applying. They offered words of advice and suggestions as I began to wrap my head around the idea of traveling so far away. Along with working closely with my advisers, I found that my most valuable resource was the program director, Dr. Ann Anagnost. After corresponding via email for many weeks, I was able to form a connection with her where I realized we had very similar philosophies around food. This connection became so helpful as my questions arose about the program itself and what we would be doing to help better my understanding my connection between culture and food. By having so many assets at my fingertips to help guide myself through the adventures that lay ahead with studying abroad, I feel confident into setting out on my journey! As my upcoming trip to Italy will be full of invigorating tastes, experiences, and memories, I am beginning to become ecstatic with the perspective that I will gain from my time abroad. I’m positive it will forever change my views of culture and, more importantly, of cuisine. But why do I have such a strong aspiration to travel half way around the globe to pursue such an odyssey? Well, let’s take a look back to see how this all began. My interest in cooking started at a very young age. I remember waking up one morning when I had to have only been about 8 years old and seeing there was nothing to eat in the house. Doing what any man would do at any age, the first thing I did was grab the bacon out of the fridge, and the rest was history. Over the past decade I have passionately strived to learn as much as possible about cooking and more so any aspect of food. By watching the Food Network religiously, experimenting with new recipes, and eventually apprenticing in some of the best restaurants in the Seattle area, I began to scaffold the means necessary to solidify my passion of preparing and sharing food with others. By being fortunate enough to work under some of the most recognized chefs in Seattle, I am not only able to fulfill my passion for cooking on a daily basis, but I am also able to integrate the experience I have gained from working into my college education. As I began my freshman year at UWB, pursuing a degree in business, I chose classes where I could continue to incorporate my passion for food into my education. By participating in the Discovery Core I and II classes, focused around two of my favorite goods, chocolate and coffee, I was thrilled to see how UW Bothell was able to use such unlikely mediums to study socioeconomics, commodification, and the cultural significance behind my two of my favorite ingredients! Plus, what other university would have a professional chocolate tasting festival as a final project?! 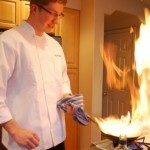 By participating in these classes I was not only earning applicable credit, but I was making real world connections with both my professors and local vendors who expressed huge amounts of interest in aiding me though out my culinary endeavors. These connections that I began to make throughout freshman year are so important because they were allowing me to establish my name with professionals in various industries at such an early age. And by having these professionals recognize a young adult as being tenacious and passionate about their field of interest, I feel as if I am setting myself up for enormous opportunity. 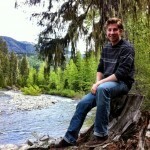 By seeing how opportunity was just around the corner at UW Bothell, I was thirsty for more. As I continued through freshman year, I had always heard about study abroad through the University of Washington, but I never thought it was so readily accessible, especially to freshmen. As I began to start the conversations with my professors, academic advisers, and peers I slowly became more determined to seek out how I could pursue traveling abroad to quench my thirst for expanding my culinary repertoire.